You'll be £20.00 closer to your next £10.00 credit when you purchase The Food Bible. What's this? This latest edition of the bestselling "Food Bible" contains the most up-to-date research and information from the world's top authorities on every aspect of food and diet, making it an indispensable reference book. "The Food Bible" explains the facts about GM and organic food, the latest research on food allergies, as well as containing expert advice on what to eat at every stage of your life, and guides you through the minefield of sometimes contradictory dietary advice with clear nutritional information. Beginning with an explanation of the basic elements that make up food - proteins, fats, carbohydrates, fibre, vitamins and minerals, the book explains how to combine them for balanced healthy eating. It then takes an in-depth look at over 80 common ailments including arthritis and heart disease, and discusses which foods to avoid and which can help to alleviate or eliminate the problem. There is a detailed examination of the controversial area of diets and weight control, providing a wealth of useful information on how to put your health first at all times. There is a collection of wonderfully, tasty, healthy and nutritious recipes for all occasions and a final chapter containing invaluable, detailed analysis of over 300 everyday foods. 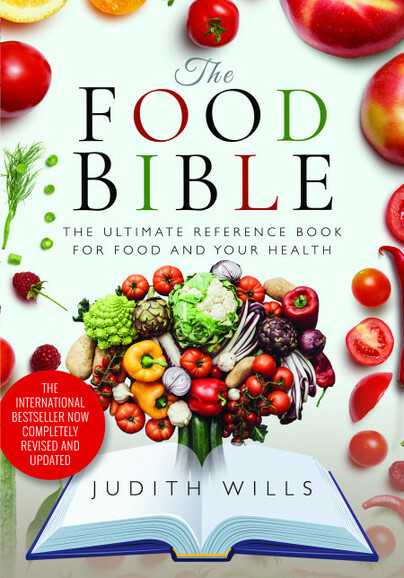 The Food Bible by Judith Wills, is one that should be out permanently in your kitchen... I have learned so much from this book. Having it out on my kitchen counter has stopped me when I am thinking of hitting the biscuit tin! Then there is The Food Bible, by Judith Wills. The subtitle, I think “the ultimate reference book for food and your health” makes it sound more stodgy than it is. It is in fact a no-nonsense compendium of what is healthy, what makes a balanced diet, food as medicine (including the right diet for diabetics, cancer sufferers, etc. food for weight control, food for different stages of life, food for health and pleasure. She discusses, sensibly and dispassionately, the advantages and difficulties of vegan eating, the truth about processed foods, organics, supplements, diet fads. It really is a go-to book if you want an informed answer about any ingredient or any diet. It’s all there. Filled to the brim with useful health tips and even a section discussing the controversial area of diets and weight control, providing a wealth of useful information on how to put your health first at all times. Such an interesting read and something anyone would find useful to have! Judith Wills is one of the UK's best-known and most knowledgeable nutrition and diet experts. She writes regularly for national newspapers and has a regular column in Saga magazine. Judith Wills presents the essential facts in this ultimate guide to all that's good and bad in the food we eat.